Average waves Saturday with onshore winds and a low point in swell, much better Sunday with a new W/SW groundswell from Saturday afternoon peaking Sunday morning to a super fun 2-3ft off Middleton and 2ft+ early on the Mid Coast before the dropping tide took away the size. This morning a new mix of swells has filled in keeping the Mid Coast around 2ft and better down South with 3ft sets off Middleton. Winds are freshening from the N/NW ahead of an expected W'ly change this afternoon so make the most of it. Today's mix of new W/SW and SW energy should ease back into tomorrow morning but into the afternoon our large new W/SW groundswell is expected to fill in. 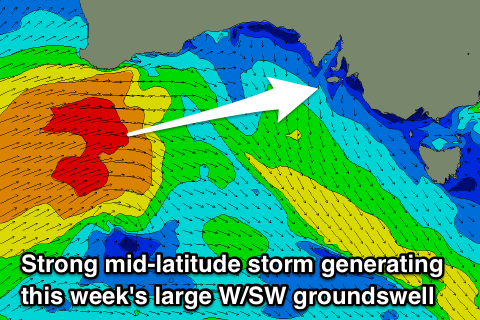 This is being generated by a vigorous mid-latitude front that is currently pushing under WA and towards the Bight, acting on top an active sea state resulting in the production of a large W/SW groundswell. We should see mid-period energy tomorrow morning coming in around 2ft+ on the Mid Coast and a similar size on the South Coast off Middleton, ahead of the groundswell proper into the mid-late afternoon. The Mid Coast should kick to an easy 3ft, with rare 4ft cleanup sets likely, while Middleton should build to 4ft+ later in the day. The swell is expected to start easing slowly across the Mid Coast on Wednesday from the 3ft range, while the South Coast will see a reinforcing SW swell generated by a tight core fetch of W/SW gales as the mid-latitude front dips east-southeast across us. This should keep Middleton around 4ft to occasionally 5ft all day,easing through Thursday from 3-4ft. Now, as touched on last Friday, winds on Tuesday aren't ideal with a morning W/NW breeze down South, tending SW and then S/SW as a strong high quickly moves in behind the mid-latitude storm. There's a chance that winds will go S/SE near dark on the Mid Coast, but Wednesday looks excellent with an E'ly offshore (E/NE-NE on the South Coast) with sea breezes across both regions (though not too strong on the Mid and offshore late). Thursday will be cleaner down South with a N/NE offshore but a trough moving in from the west will likely bring a S/SE change through the day. Further to our west, an inland surface trough across Western Australia is forecast to deepen through this week and form into a mid-latitude low. This will dominate our swell windows with no significant new swell due into the end of the week or weekend besides that off the low itself. This looks to be in the form of a large stormy S'ly windswell as the low pushes east across us on Sunday, but we'll have to have another look at this on Wednesday as the models are not in agreement regarding the strength and positioned of the low. 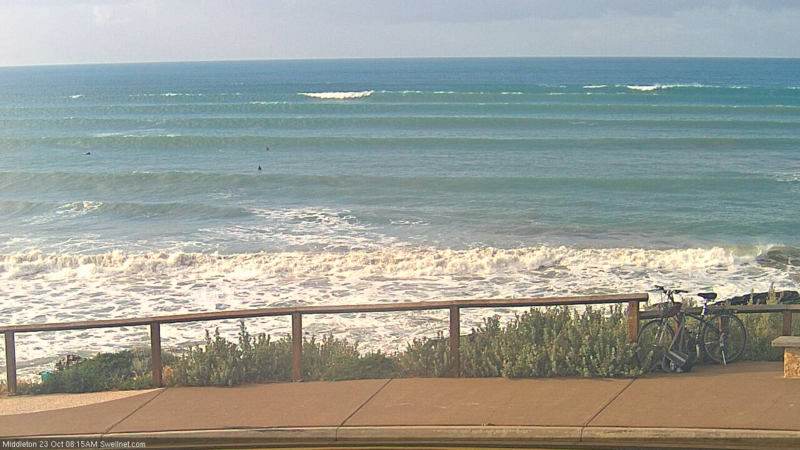 Looks like the new swell is already kicking! Ah yes... good ol' 9th Reef Middleton showing the new energy nicely.